It is rather late to be transplanting leeks, but like everything else this year, I am at least a month behind. 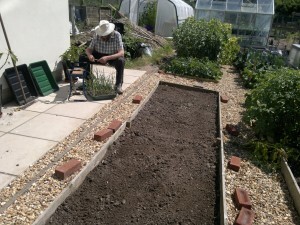 Leeks can be sown in a seed bed or seed trays; it seems that the traditional seed bed has somewhat declined in popularity, and I prefer the latter for convenience. However, I then prefer to transplant from small seed trays to larger trays, spacing them properly so that they can develop into strong plants before I move them to their final location. Today, with Dad’s help, we finally moved them into the designated bed. The bed had been covered with weed suppressing membrane over winter to prevent weeds taking over. A sprinkling of fish, blood and bone was added, then raked in. The leeks are planted in deep holes so that, when harvested, there is a good length of sweet white blanched stem. I use the handle from a broken garden fork, with the end sharpened to a point, to serve as a dibber. It is important to make a good diameter hole, and the fork handle is ideal. 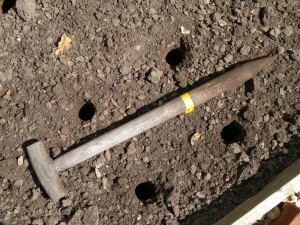 A piece of tape is useful to mark the appropriate depth for planting. We spaced five holes across the 4’ bed, although I have planted a bit closer in the past with good results. The leek seedlings were teased out of the tray, carefully separating the roots. These were then trimmed to suit the holes. The leaves were also trimmed; when disturbing or trimming the roots, it is a good idea to reduce the leaf area to lessen transpiration, so that the remaining roots can satisfactorily maintain those leaves. I have seen articles suggesting that trimming the roots and/or the leaves is unnecessary, but this is the traditional method and has worked well for me in the past. The young leeks are inserted into the holes; rotating them as they are lowered can help keep the roots together. The holes are not filled in; some soil will no doubt drop into the hole, but the leeks will also swell to fill the space. They must be watered in immediately. The easiest way is to use a small watering can without the rose attachment. Enough water is carefully poured in to fill the hole. This will wash sufficient soil down to cover the roots and settle them in. We will be keeping a close eye on them for the next few weeks, ensuring that they receive plenty of water, until the roots become properly established. 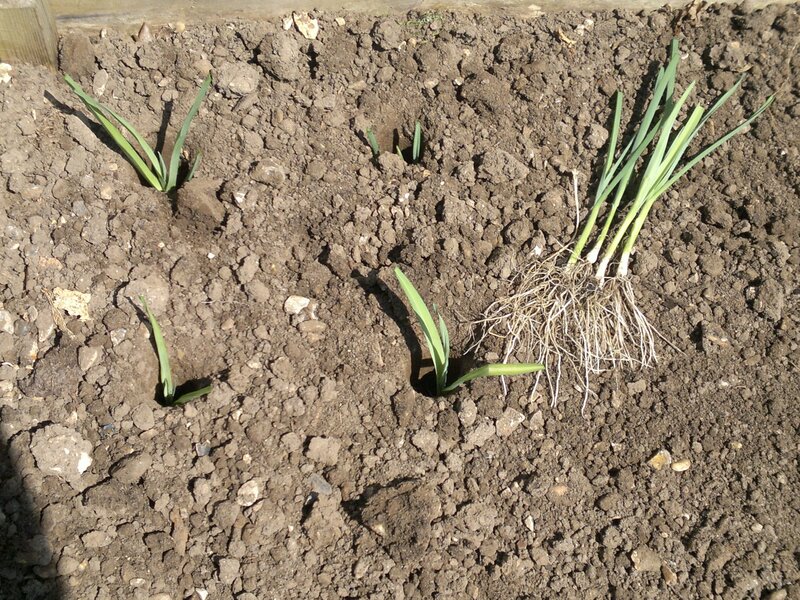 Once successfully transplanted, leeks are a fairly low maintenance crop. This entry was posted in Garden diary and tagged leeks on July 11, 2013 by JV.